When you look around you, are you looking through red, itchy eyes? Does it seem like tears or goop are getting in the way? You are not alone....it is spring allergy season. Patients in Michigan experience itchy eyes in the spring, and in the fall, in increasing numbers every year. There are some simple, non-prescription treatments, and some very effective eye drops that can be used to treat allergies, as long as that is really the problem. It is important to have your eye doctor confirm that you don't have pink eye, such as viral conjunctivitis, or bacterial conjunctivitis. Eyes can itch for many reasons, but in our bodies, inflammation causes the release of a chemical called histamines. Histamines cause blood vessels to dilate, which causes redness. Histamines also stimulate nerve endings that make you sense itching. These nerves are similar to the nerves that cause you to feel pain. A signal travels along those nerves to the brain, and you percieve itch or pain. Whatever you are allergic to, the cells along the lining of the eye and eyelid release histamines. This is why anti-histamines are the most commonly used medications to fight allergies. Is it really an allergy? Or infection! It can be difficult to tell whether the problem is allergy eyes or pink eye from a virus or bacteria. In many cases, an eye doctor needs to help make that determination. A few rules of thumb may help. First, if a patient gets red itchy eyes every year at the same time of year, that may indicate allergies. The discharge from allergies tends to be white or white-gray in color and is more mucous, vs. more of a green or yellow pus with infection. If only one eye is affected, it may be a bacterial infection, which will go away in three to five days, even without treatment. 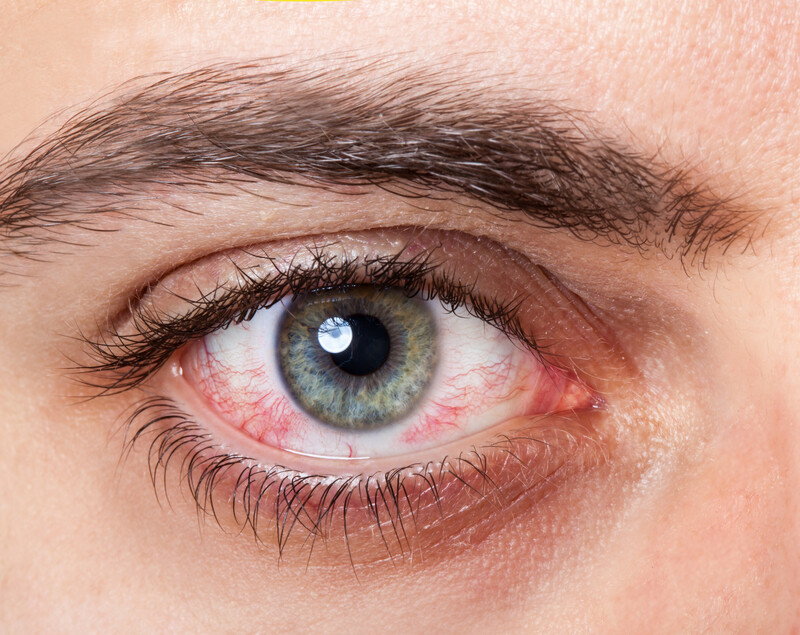 Viral pink eye is usually associated with some cold symptoms like a sore throat or sniffles. Viral pink eye takes a week or a week and a half to to away and is extremely contagious! Patients are warned to wash their hands frequently and avoid sharing face towels and pillows until they are clear. Antibiotics won't help with this type of infection, so treatment of symptoms is the only thing that can be done. Just like when patients have a cold, the viral pink eye has to 'run its course'. Another common cause of itchy eyes is blepharitis, but this tends to be a long-term, year-round problem that is treated with eyelid cleaning. There are a couple of basic things that you can do at home to treat your itchy allergy eyes. Cold compresses with a clean washcloth will help with swelling and itching. Artificial tear drops will make the eyes more comfortable, and help rinse some of the allergic particles of the front of the eye. There are over-the-counter eyedrops for allergies that may be effective for redness and itching. These drops tend to be anti-histamines in an eye drop form. Some of the more modern prescription allergy eye drops work much better because they stop the inflammation from allergies at different levels, even before the histamines are released. See your eye doctor for more information, and to make sure that the only problem is allergies, not an infection!